Entries for Saturday 07 June 2008, The randomness of tomorrow, today! All this tells you is that the connection is encrypted; it doesn't tell you who's at the other end. You can be sure that the data probably won't be intercepted, but you can't be sure it's going to who you think it is. Firefox 3, however, not only supports the more recent certificates that can prove the identity, but it also presents them in a much more user-friendly manner. 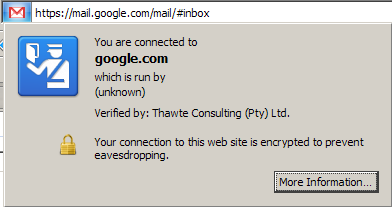 A grey background to the favicon area, and a popup when you click on it that informs you my website is unencrypted. A blue background, and a popup that tells you the connection is encypted but that Firefox doesn't know who's in control. A secondary advantage of this is that fake sites that try to trick you with padlock favicons shouldn't work, because they can't change the background and FF3 doesn't use padlocks. This is much more useful than just a padlock, especially since you might think the padlock meant "safe", when all it really meant was "encrypted"; it didn't protect you against fake sites with encryption. Opera has a similar system; is displays the ID, but since it doesn't use colours it isn't quite as obvious what level you're at. 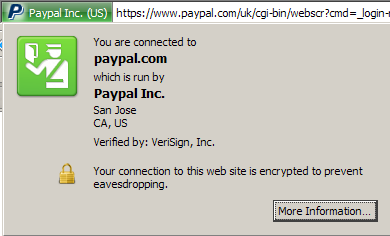 It also doesn't appear to have quite as readable an explanation as Firefox. Apparently Firefox 3 also has a warning that uses the guy on a yellow background for invalid certificates, and the guy on a red background for reported phishing sites... but I don't know any URLs that will trigger them for a screenshot. There are more details, and screenshots of these other two, at this blog entry.